Give Thanks: Ribbon Kyuri Salad with Asian Dressing & The Award!
" Sometimes Happiness Can Be Found In Simplest Things & God Provided For Us Everyday -- Food". 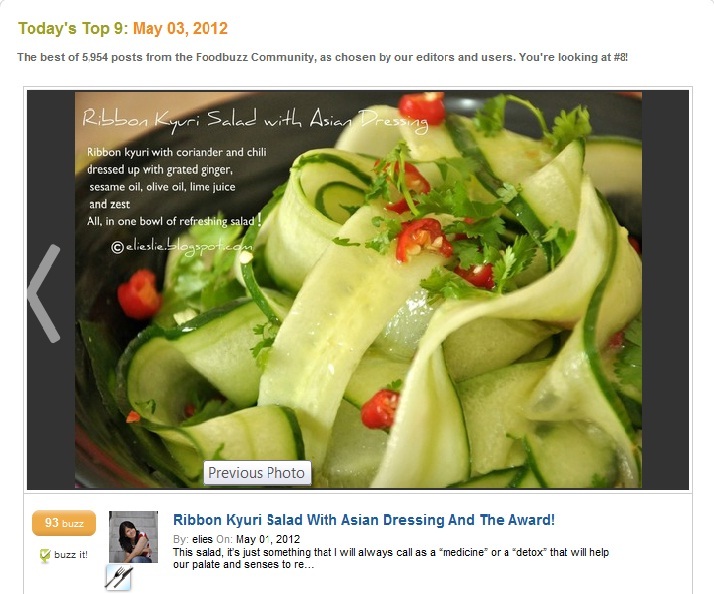 Ribbon Kyuri Salad with Asian Dressing & The Award! So, reader and blogger... would you please forgive me for this late post? Don't you agree if I say that, nothing can compare a refreshing salad after a hectic day?! Well, dessert is something that we often call as an indulgence after a long day. But salad, it's just something that I will always call as a "medicine" or a "detox" that will help our palate and senses to regain their memory back... And that is, truly something most precious for us, blogger, cooker and food enthusiasm - our palate and senses! This refreshing and healthy salad is just light with a little hint from ginger, chili, lime zest and juice. Fragrant with flavor of sesame oil and cilantro, fresh with their refreshing green color and crunch. I have this salad a few times with grilled prawn and baked salmon as lunch or dinner, and yes, I finished a whole bowl alone and still want more! In a salad bowl, grated the ginger and make a zest from the lime and juice. Add in sesame oil, soy sauce and extra virgin olive oil, check the seasoning. Peel the cucumber with a peeler so the cucumber will look like a long ribbon. Discard the watery core. Take the coriander, tear apart the leaves and finery chopped the stalks. Place the coriander leaves inside the cucumber and sprinkle the stalks on top. Finery chopped the red chili and sprinkle over. Toss and dress until you ready to eat. So thank you Ridwan for the award! will surely make this salad a one to try for your busy dinner or just a fresh treat for our precious palate and senses! Stay Healthy and Loves Your Kitchen More! It's on Foodbuzz Top9 at 3May 2012! YaY! Thank you Elies! I will be taking 1 month off too for blogging :) Hope to see you in Jakarta! Glad to see that you are back. We all need a break now and then and life does sometimes take over. Congrats on the award and you did make some good choices when passing it along. Your salad looks fabulous. It is getting hotter here so more salad will be on the plate. 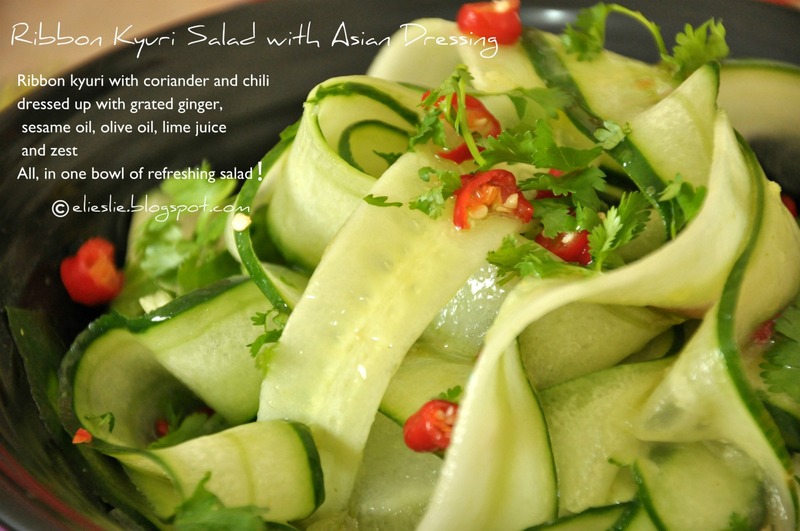 Nice to come across a salad recipe that showcases delicious cucumbers-yum! and we do need a refreshing salad since the weather is start to be hotter now! I foresee a phase like that for me, May will be crazy! Welcome back, and what a great salad to start us off with. That salad looks delicious! So bright and healthy! Love those cucumber ribbons...so appetizing, tasty and pretty. what a delicious looking salad! I love cucumber salads and this is a must to try! Congrats on the Top 9! Wow, this is fantastic, I love it. Great photos and pictorial. This is on my list of salads. Thanks and Congrats on the Top 9! Hi Elies! First of all, welcome back! How was the trip? How have you been? I'm so sorry that I come here late after you told me about the award. A lot of things are going on and I'm always late to leave comments...but I'm here! :-) So happy to read your post with this delicious salad. I love the texture when you slice the cucumber like this. Great recipe! And looks like you had top 9 with this. Congratulations!